You may have even created an account after seeing another nonprofit’s story on Twitter. And when dipping in from an email digest, maybe you noticed the big-format, window-like photos and surprisingly high-quality writing that seems to be the norm. Me, I’ll never forget how a practical and compelling story convinced me to write my representatives about gun control for the first time. I’ve been using Medium personally and I’m blown away by the inspiring ideas that are shared each day — in stark contrast to the no-brain share-drivel that occupies our feeds. 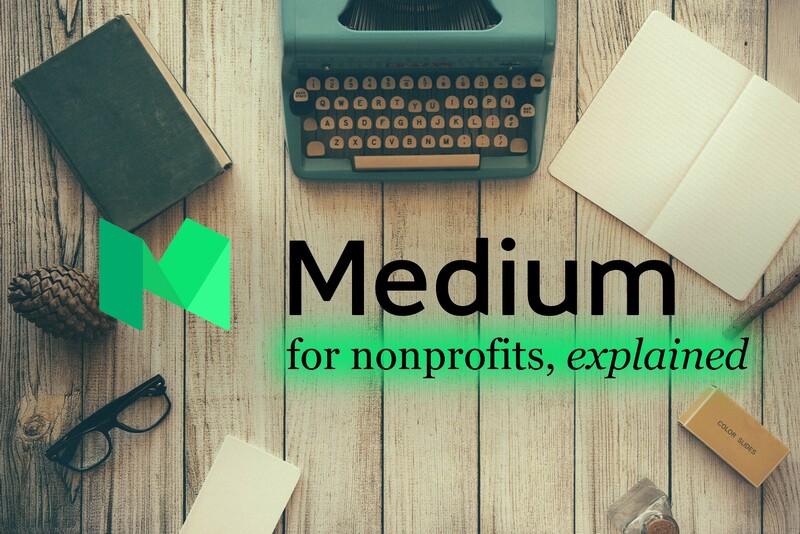 I’ve also helped my nonprofit clients use Medium effectively over the last couple years, so I wanted to share some guidance if you’re thinking about jumping in. Because I believe that now, more than ever, is the right moment to get started. Let’s get this out of the way first: Why should my nonprofit join *another* social network? I get it. Google+ still hurts. And, it takes precious staff capacity and internal political capital to convince an organization to expand its online footprint. You should never launch into a new presence without careful consideration. Is your nonprofit’s blog easy to find on your website? Are the posts you work so hard to create getting the level of attention you want? What’s the reading experience like? Is the text the right size? Does it look great on mobile? Are the photographs you’ve collected from your programs given space they deserve? Do you have in-depth analytics for your content, like what percentage of visitors actually read the full piece? Will your biggest supporters get a mobile push notification when you add a post? Or just an email… or nothing? Are you reaching audiences beyond those core supporters? Is anyone — you, your board, your partners, or your field at large — really excited about the posts you’re creating each day/week/month? If you’re like most nonprofits, you probably shook your head at a few of these. I have some very predictable great news: Medium is awesome at all five. So if you’re slowly nodding that this Medium thing might be worth exploring further, let’s dive in. When you’re pitching the idea to use Medium with your team, here’s a tip: It doesn’t have to replace posting your best posts to your own blog. Instead, start by taking a promising upcoming post — ideally one that’s friendly to visuals and has a unique story — and posting it in both places. Then, compare. Medium can turn your hidden gems into conversation starters for the field. When The Commonwealth Fund created a series of in-depth research about the potential impact of the King v. Burwell Supreme Court decision on health care, they knew there was an audience beyond its own blog. So they created a Medium post, The Day After King v. Burwell*, that explained the stakes for millions of people and released it the week of the decision. The result? Thousands of views, extensive social media activity and coverage on major policy news sites. The next time you have a gem in the pipeline, try putting it on Medium and seeing how your audience responds. Create multi-photo spreads by clicking add photo icon and selecting multiple photos at once. Use animated gifs to give your data charts life, or show before/after photos. Add tags to your stories to maximize exposure and searchability. And, tag other people/organizations in the body of your stories (type @Name and it’ll autopopulate) so they get notified when you mention them. Hi, Ev! Use the “share draft” feature to send the story to key reviewers — no logging into a CMS required. And if you want to syndicate your blog to Medium, try the IFTTT>Medium integration that uses RSS to automatically create Medium post drafts for all your blog posts (that you can edit and then publish). Forget the “interactive annual report.” It’s custom, expensive, shoehorned into some publications section on your website, and totally unweildy to maintain or update for next year. We’ve all seen them, we’ve all skimmed them for 2 minutes, and we’ve all moved on. There’s gotta be a better way, right? Instead, what if you took the content from your (likely still essential) print report pdf and broke it into three Medium posts: an opening letter from the president telling the story of the last year with embedded tweets from supporters (like Sue Desmond-Hellmann’s reflections on her first year as the Gates Foundation CEO), Instagram photos from your work in the field, and that amazing gala video your team created; an overview of the programs you fund that includes a map and full-screen photos of the people and places you partner with; and a state of the organization post with the financial charts you’ve created as animated gifs wrapped in a narrative about your vision for the year ahead. Each post would link to the next in the series, creating a rich reading experience that’s beautiful on any device, easy to share, and an order of magnitude cheaper and faster to create than a custom annual report. Use integrations to give the posts life, like videos, Instagram or Facebook posts, tweets, Soundcloud audio, vines, and much more. Just click the (<>) option in the + menu while editing and paste a link. Get formatting inspiration from other Medium publications like Backchannel, Matter and The Message. Do you feel constrained by the type of content you post to your current website? Is a clunky CMS or a risk-averse team holding back your creativity? Medium is an excellent place to experiment with new content ideas that can provide a window behind the scenes and drive interest and donations. Open letters to leaders about your issue, like this note from Michael Pollan to the next president, laying out a new national food policy. Explainers with clear language and visuals, like this primer on financial well-being*, that you can share with media and policymakers to get them up to speed on your issues. Event or meeting recaps to ensure that key lessons, plus video replay and key tweets, live on in a searchable, shareable way. E.g., Meeting with Clinton and Sanders. Public responses to clarify discussions in the news or respond to criticism, like Jay Carney’s rebuttal, “What The New York Times Didn’t Tell You,” about Amazon’s culture. Call for suggestions to your organization’s most important questions, letting your network use the easy commenting feature to respond. Add your own comments to relevant stories that are getting traction on Medium, sharing your perspective and growing your network. Profiles of notable leaders doing important work in your field, like The Heinz Awards did with its 2015 Honorees*. Whistleblowing like Ninjas for Health did with the 21 Strangest Coca-Cola Partnerships (spoiler, they’re all public health campaigns). The list goes on and on… and I would love to hear your ideas in the comments. Will this divert traffic from my website? Either you have this question, or you will face it. And it’s fair. I typically respond with two concepts. Communications is an impressions game, so hitting your audiences in multiple places with the same messages conveyed in unique ways is important, and Medium is a great way to do that. There’s a network effect in play, with a Medium algorithm behind it, that translates views and recommendations and high read percentages into more exposure for your posts — via features on Medium.com, in the mobile app, and, crucially, in email digests. Done well, your posts will help you reach new and larger group of people who you can encourage to visit your website, follow you on Twitter, and potentially contribute to your cause. Finally, with a well-placed link to your website at the end of a Medium post, you may find that more people come to your site from Medium than the other way around. We’re at a fascinating moment in the evolution of Medium as a platform. They just announced a major new round of funding, made huge improvements in the experience for writers and readers, and turned their logo green. They’ve crossed The Chasm and — much like Twitter in its influential early days — are pulling in high-profile media and policy folks who fall right into the audience sweet spot for most nonprofits. Plus, it’s still new enough to give you that “somewhat-early-adopter” bump. But I’ve never been this excited about a platform for my nonprofit partners. Where else can you find such a rich collection of curious, creative and thoughtful stories that ask big questions and try to help explain our world? And what other platform makes it so easy to take these ideas and present them in their most beautiful form? For most nonprofits, I think it’s time to get busy writin’ and join the fun. My hope is that this answers a lot of common questions about Medium for you all. Give it a recommend and send it around to your nonprofit friends if you find it useful! Thanks, @alexfield. Creative communications strategist. Lead digital advocacy @berlinrosen. Searching for social good tech, obsessed with impact, and happy to geek out. Musings on media, culture, life and more — for and from nonprofit communicators. www.burness.com.